Yes, they’re pretty. But these gorgeous thugs will also crowd out other more desirable plants. One reasons it’s so hard to control violets is that they’re so dang lovely. When they’re in full bloom in April and May, you have to steel yourself to yank out a thing of such beauty. But be strong. 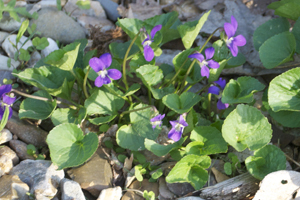 Second probably only to creeping charlie, violets are one of the worst spring weeds and the toughest to get rid of. If the violets are in a spot set apart from perennials and other plants, you can use Roundup (or another brand of non-selective herbicide). Granted, I prefer not to use garden chemicals, but Roundup is one of the least dangerous for the wenvironment. Hand pulling or weeding is laborious, but it’s the best way to control violets. You have to be persistent and do multiple weedings through the spring and summer, when violets are growing fastest. It’s also a little tricky since violets have long, thin, spreading roots that are difficult to get all of. And if you leave one little bit in the soil, the violets come back. Within a day or two after weeding violets, it’s high advisable to mulch thickly the area you weeded. Apply two or even three inches of a wood chip or other mulch over the area. This will suffocate any small bits of plant left in the soil and make it more difficult for them to come back. The mulch also will make weeding down the road easier, since the violets can be more easily pulled out of the loose mulch. The most effective way to control violets in lawns is chemicals. Pulling violets out of turf is almost useless (you can’t get those roots) and certainly, you can’t mulch a lawn. Most lawns that use a lawn service don’t have violets. That’s because lawn services apply a “broad-leaf” weed killer at the optimum time in summer. This appropriately named weed killer destroys the broad-leafed plants such as violets (and dandelions) and leaves the thin-leafed plants—like your grass. If you don’t use a lawn service, go your local garden center and check out the various chemicals that you can spread on your lawn that tout themselves as “broad-leafed herbicides.” Otherwise, simply look for something made for lawns that specifies controlling violets. One note: Violets do best in light shade. Grass does not do well in light shade. Wherever grass struggles, weeds fill in. So your violet problem in your lawn may be because you’re growing grass in a place it really shouldn’t be growing. Consider trimming up trees, cutting out overgrown shrubs, etc. to allow more light in to the lawn. Or give up on the grass altogether and plant groundcovers, hostas, and other shade-loving perennials.